How to grow food with Hydroponics 365 days a year #infographic ~ Visualistan '+g+"
Imagine how to supply with enough food for the global future population when it is expected to grow by 50% by 2020, while the soils and fresh water are increasingly reduced? That would be a huge issue to deal with for the agriculture. And one of the best methods have been used and will definitely be too are Hydroponics. Hydroponics, made from two terms "Hydro" defined as water and "Ponics" as labor. So working water is the raw meaning. In essence, it is a method of growing plants without soil. Plants are grown in a water environment full of nutrients. Growing media like perlite, hydroton, vermiculite, etc are used as a substrate to hold and transfer nutrients to plants. It is such a very effective growing way that has been proven in the large-scale greenhouses and by home growers as well. 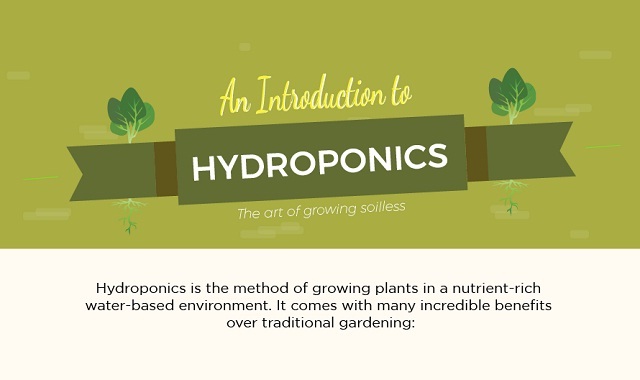 Check out infographic by Greenandvibrant.com for essential knowledge about Hydroponics. You will learn about which plants you should start with, how it has won over traditional soil gardening, and what types of Hydroponic systems there are. Why not start your own indoor gardens and enjoy fresh food throughout the year with Hydroponics?